Please Note: All Engraving will be Centered horizontally and vertically unless otherwise specified in the comments section. Also, a nameplate's content may consist of just one line, or just one word, which will be centered horizontally and vertically on the plate. Please note: All fonts are available in upper case and/or lower case. WE DO NOT recommend all Upper Case for Standard Script, Single Line Script or Old English. All upper case in ANY Script and Old English is very difficult to read. For a "heavier" appearing letter, we recommend Goudy Block, Standard Block or Helvetica. Greek Letters are also available upon request. OUR ENGRAVED LETTERS ARE MADE UP OF ONE OR MORE ETCHED LINES (depending on font). OUR ENGRAVING IS DONE BY DIAMOND POINT ENGRAVERS, NOT BY LASERS. WE NORMALLY DARKEN THE ENGRAVED LETTERING BY OXIDIZING AFTER THE ETCHED ENGRAVING IS COMPLETE. IF YOU DO NOT WANT THE ENGRAVING BLACKENED, PLEASE LET US KNOW ON THE ORDER FORM. SMALL LETTERS CAN APPEAR DENSER, WHEREAS BIGGER LETTERS ARE LESS DENSE. 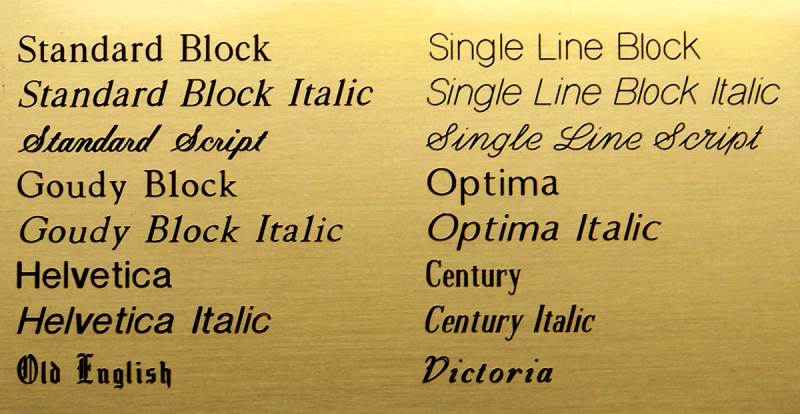 Victoria, Century and Standard Script are OUTLINE fonts--will not engrave solid. Please ADD $2.50 per item if you require very specific size fonts and/or spacing. This requires extra design time. Just specifying "larger" or "smaller" or different fonts is no extra charge. If special horizontal spacing is required, please also make a note on the order. Additional space(s) are not always apparent in the copy. Proofing Policy: Our pricing DOES NOT include proofing. If a proof is required, the cost is $10.00 per item plus $5.00 for each revision per item. Proofs can be faxed or mailed only. Proofing could delay your order by a day or two.